Budget BlackBerry 9720 winds clock back to BB 7, but who's biting? It's slow. It's dated. The display is tiny. There aren't many apps. It looks and feels cheap. It runs the older BlackBerry 7, not the newer BlackBerry 10. And people wonder why BlackBerry's in trouble. Better phones are widely available. The announcement of the BlackBerry 9720 was not met with widespread excitement, largely because it is running the older BlackBerry 7 operating system and not BlackBerry 10. The company has repeatedly pointed out that there's life in the old BB7 yet. Is it right, or is this an unwelcome step backwards? We got hold of the handset to find out. Before we jump into the underwhelming specs it's important to note that this is firmly aimed at first-time smartphone users. BlackBerry's Executive Vice President for products, Carlo Chiarello, explained that, "It's perfect for customers upgrading from a feature phone or entry-level Android or Windows Phone device, as well as existing BlackBerry smartphone customers, that want a richer experience and jump up in style and performance." 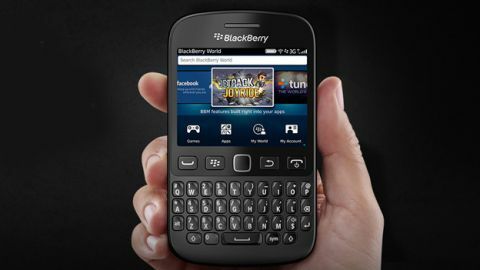 Sporting a 2.8-inch IPS touchscreen with a resolution of 480 x 360 pixels, and a 35-key physical, QWERTY keyboard, the BlackBerry 9720 has the classic BlackBerry look. Inside there's a 806MHz processor along with 512MB of RAM, a microSD slot, a 5MP camera, support for Wi-Fi, Bluetooth, 3G HSDPA and a 1450mAh battery. Those specs are limited, but the BlackBerry 9720 will cost you £165 SIM-free, £99.95 on PAYG or you can pick it up for free on a two-year contract at £11 per month in the UK. Compare that with the £280 price tag on the BlackBerry Q5 and you can begin to see the potential attraction for BlackBerry fans on a budget. Competition at this price range comes from the Nokia Lumia 620, the Sony Xperia U, and the Samsung Galaxy Fame. At first glance the BlackBerry 9720 looks like a new model of Curve. Taking it out of the box it feels quite solid; in fact it weighs in at 120g (4.2oz). The bottom of the screen is broken up by the classic BlackBerry keys: send, menu, escape, and power, with a touchpad in the middle. The keyboard beneath is surrounded by matt plastic. At 114 x 66 x 12 mm (4.49 x 2.60 x 0.47 inches) it's certainly very easy to hold one-handed. There's a rubber strip that runs all the way round the sides and encompasses the headphone port, top left, the lock button up top in the middle, the volume and mute keys and a dedicated camera key on the right spine, and your micro-USB port and dedicated BBM key on the left spine. It feels and looks cheap and nasty. The textured back plate is ribbed, black plastic with the silver BlackBerry logo, and it's easy to remove thanks to the opening at the bottom which allows you to insert a thumbnail. Flip the battery out and you'll find the SIM slot underneath. The microSD card slot is at the top, to the right of the camera lens and flash. It's oddly angled and leaves you feeling unsure whether the card is actually inserted correctly. You can't expect a premium feel at this price and you certainly don't get one, but the 9720 is comfortable to hold and easy to manipulate with one hand. Oh, and it comes in black or white - fancy.